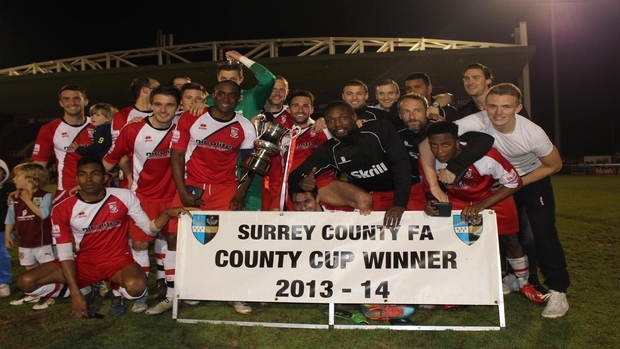 Woking win the Surrey Senior Cup! Woking ended the season on a high as many had expected them to do winning their twelfth (12th) Surrey Senior Cup Final at their home ground in front of a crowd of 832. The staff and the players at Woking FC were clearly taking this game seriously as the team that was fielded was very much a strong first eleven. The only players not in the team were of course Mark Ricketts who was suspended from receiving a red card in a league game against Forest Green. So that gave way for Brett Johnson who stared on the bench, Mike Cestor moved to centre-back while Keiran Murtagh came into the middle of the park. The game started brightly as the first real bit of action came in the first couple of minutes, when Metro Police goalkeeper punched clear a corner only for Keiran Murtagh to smash wide a half volley to the left of the right sided post. Shortly after it was Scott Rendell who grabbed the first goal of the night from a Josh Payne Free-Kick. Ten Minutes later a sprint into the box from Veteran Kevin Betsy left the Metro Police defence forced into making a rash challenge bring down Betsy only for the referee to blow his whistle and point to the spot. Scott Rendell stepped up and converted calmly. A number of chances passed and Scott Rendell came closest and just misses out on that hat-trick, but shortly after it was Gez Sole who pouched on a defenders mistake converting from 10 yards making it 3-0 going into the break. The second half began and Woking, as expected, started off slowly and a bit flat and some would say “the game is over now”, but Metro Police did hold their own and started to produce some of their own chances causing Sam Beasent to make a few fine saves and he did well to keep his well deserved clean sheet on the night. It was substitute Reece Beckles who done well and crossed into the box only for it to squeeze into the nearest bottom corner. Shortly after however John Goddard found himself unlucky not to get a goal or TWO on the night! As Kevin Betsy came onto his left foot only to shoot and force a save out of the Metro Police goal keeper only for Reece Beckles to almost “air-kick” to ball which rolled to John Goddard who shot from an acute angle and it to hit the post! However it was not long for the next goal and it was Brett Johnson who scored his 3rd goal in as many games to make it 4-0 for the home side. Then it was Kevin Betsy’s turn to take the limelight as he scored a perfectly hit left footed shot from the right hand side of the 18 yard box into the opposite far corner which topped off a brilliant season for Woking FC. There were different emotions around the ground after the game, some upset that this brilliant season/era has come to an end and some were delighted to end the season on such a high. I can tell you that everyone left with a smile on their face! It has been a cracking season and a joy to be covering Woking FC. Already looking forward to next season!